A machine known as an oximeter is used to estimate how much oxygen is in a child's arterial blood by measuring the proportion of oxygenated hemoglobin in the blood. This may be done by placing a probe that squeezes around a small, thin body part (usually a finger tip) and uses light to make the measurement. The test does not hurt, is not harmful, and is not usually frightening. The normal test result is 95-100% oxygen saturation. The number may be expected to be lower for a child with congenital heart disease. An oximeter is a photoelectric device. It transmits light through a thin part of the patient’s anatomy – usually a finger tip, toe, ear lobe, or newborn baby’s foot. 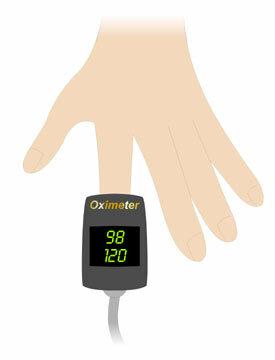 There are various forms of oximeters. Some are taped to the body extremity and only used once; others are reusable. Oximetry is usually performed with a pulse oximeter, which responds to the pulsations of blood in the tiny vessels, or capillaries, in the body part tested. The device is placed on the body part, exerting very light pressure. The oximeter then transmits red and infrared light through the pulsing capillaries. The ratio of red to infrared light that gets through is used to determine the pulse oxygen concentration in the capillary blood. This is possible because oxygen-rich “red” blood absorbs light differently than purple or blue deoxygenated blood. Each pulse brings a fresh surge of oxygenated blood from the heart. By subtracting the reading obtained from the blood between pulses, the device is able to determine the oxygen concentration (i.e. the percentage of hemoglobin molecules bound to oxygen molecules) of the fresh blood only. After the light has been transmitted and the calculations have been made, the measurements appear as numbers on the face of the oximeter, showing the oxygen concentration percentage and the pulse rate (heartbeats per minute). Other forms of oximetry may be used to measure the oxygen concentration of blood within the heart or blood that has been drawn from the body.